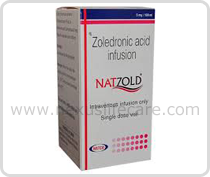 Zoledronic Acid Injection manufacturers, distributors, dealers & suppliers in Mumbai. Uses:-Zoledronic Acid is used for treating high blood calcium levels caused by cancer. It is also used with other medicines to treat patients with certain types of cancer. Zoledronic Acid is a bisphosphonate. It works by decreasing the breakdown of bone. This reduces the amount of calcium that is released into the blood from bones and helps to lower your blood calcium level.Zoledronic Acid available as Zoldria 4mg, Zoletrust 4mg, Zometa 4mg, Zyfoss 4mg.